What Are the Different Parts of a Snare Drum? Most snare drums include the shell, drum heads, rims, lugs, tension rods, snare guard, and the strainer mechanism. When looking at percussion instruments, the parts of a snare drum include the shell, drum heads, rims or hoops, lugs, tension rods, snares, snare guard and the strainer mechanism. The interconnected nature of the parts of a snare drum mean that getting just the right sound and response from the drum requires looking at everything on the instrument, not just a single part. Many professional drummers who understand the qualities of each snare drum part mix and match different styles and materials to create the sound they prefer. The main component of the snare drum is the shell. Shells come in two major types: wood and metal. Wood ones are either carved out of large logs to provide a seamless circle of wood, or they are carefully shaped over a frame. These shells provide a very warm, natural sound because of the uneven surface, thickness and density of the wood, which is good for eliminating upper overtones and bleeding during recording. Metal shells normally are made of stainless steel, brass or aluminum, providing a little better projection because of the thinness and smooth surface of the metal. Parts of a snare drum also include two drum heads. These fit on the top and bottom of the shell. The one on top is called the batter head because it is the one the player strikes while performing, and the one on the bottom is called the snare head because of its proximity and relationship to the snares. Normally the batter head is thicker than the snare head, simply because it takes more abuse and has to stand up to being struck. Heads can be either animal skin — calfskin most commonly — or plastic, with the most popular plastic options being Mylar® and Kevlar®. Next come the rims or hoops, which may be flanged, die-cast or wood. Flanged hoops are pieces of metal that are molded into a circular shape, while die-cast ones are metal poured directly into a mold to create a solid hoop. Wood rims are made similarly to wood shells. Players sometimes hit their sticks directly on the rims to provide a "rim shot," which is a very loud popping or cracking sound. This, along with the fact the rims help hold the drum heads in place, means that durability of the rims is essential. The lugs and tension rods are two other major parts of a snare drum. These work together to provide tension for the drum head. Tension rods fit through holes in the rims and screw into the lugs, which are placed directly onto the snare drum shell. By tightening or loosening the tension rods, players can adjust the pitch of the drum and, to a degree, the amount of "give" the drum head has. Although all the parts of a snare drum contribute to the sound of the instrument, the drum's characteristic buzzy sound is created through the snares. These are strings of gut, cable or wire that stretch over and vibrate against the snare drum head as the player performs. The different types of snares have different physical properties that affect how the snares vibrate, which impacts how "dark" or "bright" the snares sound. None of the snares is any better than another overall, but certain types of music may require the specific sound from one of the three snare types. Most snare drums have a snare guard to protect the snares during use, storage and transport. Lastly, snare drums have a strainer mechanism, as well. This part of the drum controls the snares and contains both a lever and knob. Players use the knob to make small adjustments to the snare tension, while the lever is used to "throw off" the snares completely so they no longer touch the snare head, making the drum sound more like a tom drum. How Do I Choose the Best Snare Drum Lessons? How Do I Choose the Best Snare Drum? What Are the Different Types of Bass Drum Hoops? How Do I Choose the Best Vintage Snare Drums? What Are the Different Types of Snare Drum Rudiments? 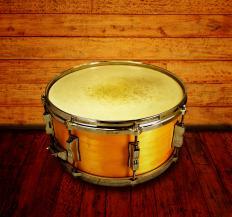 What Are the Pros and Cons of a Wood Snare Drum? What Are the Different Types of Snare Drum Music?